The Eastern Time Zone, as its name suggests, applies along the eastern side of the United States and is one of the four big time zones used in the contiguous United States. Nine standard time zones in total are used across the United States and its territories, with the first four being introduced back in the late 19th century. 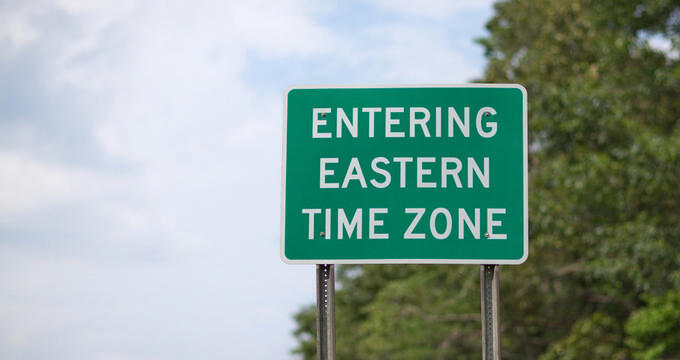 The Eastern Time Zone applies in more US states than any other time zone and applies for around half of the US population, as well as covering the capital city: Washington D.C. The Eastern Time Zone encompasses 17 US states in their entirety and also applies in parts of five additional US states. It is generally used as the dominant time in media and TV schedules, with most cable and national networks focusing on Eastern Time as a priority, and then mentioning other time zones afterwards. Outside of the US, the Eastern Time Zone is also in effect in large parts of Canada, one Mexican state, several Caribbean Islands and Panama in Central America. Some areas of South America also use the same time as the Eastern Time Zone. Time zones didn’t exist in the early years of the United States. Until the late 1800s, time would be told through the use of the sun. From town to town and state to state, people would look at the sun and wait until it crossed over the meridian to set their clocks to midday, and that’s how time was set all around the US. There were no norms or time zones or standards around the nation, which actually led to quite a few problems, especially as the United States started to grow and develop. When the railroad network began to spread all around the US, for example, the existing timekeeping system proved highly problematic. Trains need to have strict timetables and organization, but the time was different at every station and town, so commuters and passengers struggled to keep track of train times. The train authorities eventually decided to make their own time zone system, dividing the nation up into 100 different railroad time zones. This system helped to make everything more organized but was still problematic and complicated in many ways. Therefore, in 1883, it was decided that four major time zones would be introduced into the United States. The continental US was split into four zones: Pacific, Mountain, Central, and Eastern. These four zones, all separated by one hour of time, were carefully mapped out. Then, on November 18 of 1883, telegraph messages were sent out to major cities in each zone, telling them exactly how to set their clocks. From that point on, time was regulated in the US and additional time zones would later be added for other states and territories like Alaska and Samoa. The Eastern Time Zone (ET), like other US time zones, is divided into both a standard version, Eastern Standard Time (EST) and a daylight version, Eastern Daylight Time (EDT). The former is five hours behind Coordinated Universal Time (UTC), while the latter is just four hours behind UTC. Eastern Standard Time is used from November through to March, while Eastern Daylight Time is used for the other months of the year. In the US, seventeen states are included in the Eastern Time Zone in their entirety: Connecticut, Georgia, Delaware, Maryland, Maine, New Hampshire, Massachusetts, New York, New Jersey, Pennsylvania, Ohio, North Carolina, South Carolina, Rhode Island, Vermont, Virginia, and West Virginia. Five additional states (Florida, Indiana, Michigan, Kentucky, and Tennessee) are partly included in the Eastern Time Zone. All around the world, systems of daylight savings are used to save energy and adapt to the changing sunset and sunrise times in various locations throughout the year. The idea of daylight savings in the US had been around for a long time before being officially established in 1966 with the Uniform Time Act. In the Eastern Time Zone, this act meant that clocks would go back one hour to EDT on the first Sunday of April and forward on the last Sunday in October. Decades later, in 2005, the Energy Policy Act changed the dates of daylight savings. Since then in the Eastern Time Zone, EDT is observed from the second Sunday of March through to the first Sunday of November. Daylight savings time is used throughout the Eastern Time Zone in both the US and Canada, while Mexico, the Caribbean Islands, and Central American areas each have their own rules and dates.